We got featured on one of the local news shows (KOLO-TV - abc affiliate in Reno, NV) and they ran the segment at least twice (I was interviewed on-camera). Also, US House of Representatives candidate, Rick Shepherd and his family came by and spent at least one hour. Northern Nevada is in a unique position to be at the forefront of the Electric Vehicle revolution. As EV enthusiasts we can make a difference in accelerating public education, encouraging sensible legislation, and providing feedback for proper deployment of a multilayered charger network. It's once again time to get out and show our support for an electric transportation system that can work for everybody. 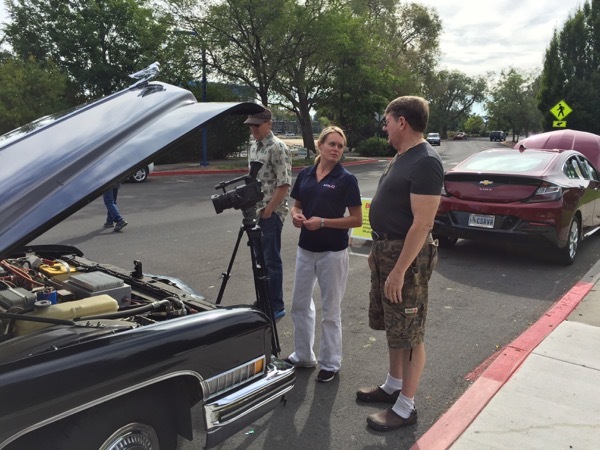 The Reno chapter of the Electric Auto Association (EAA), in association with Plug In America and the Toiyabe Chapter of the Sierra Club will be hosting an event on Sunday, September 17th, at the Pavillion on the west side of Virginia Lake Park, 1980 Lakeside Drive, Reno, Nevada. Beginning at 9:00 a.m. and wrapping at 2:00 p.m., we will have a diverse collection of electric vehicles on display. The public will be able to engage with EV owner/drivers, and find out how an electric vehicle can work for the average person to keep our air cleaner, reduce carbon emissions and mitigate global climate change, and reduce the overall costs of family transportation. The public will also be able to find out more about how rooftop solar can help charge their EVs, while keeping family utility costs down. We also expect members of the Reno City Council to attend. As the event is being held at Virginia Lake Park, we encourage attendees to bring a picnic lunch, and stay awhile to visit, get a little exercise and enjoy the last days of summer. Public BBQ grills are available. Registered attendees report 72,400 electric miles driven.